UPDATED: Thu., Nov. 15, 2018, 9 p.m.
After lopsided losses to a pair of college basketball heavyweights, Eastern Washington is ready to take on someone its own size. And in its own arena. The Eagles (0-2) host Wisconsin-Green Bay (1-2) on Friday at 4:45 p.m. in a home opener at Reese Court, as part of the 2K Empire Classic. EWU, which hosts a portion of the tournament, will face either Morehead State or Missouri-Kansas City on Saturday at 3:15 p.m. at the same venue. MSU and UMKC play Friday at 2:30. The Eagles lost two preliminary 2K Empire Classic games last week, a 66-34 loss at No. 16 Syracuse and a 81-47 loss at No. 14 Oregon. Second-year head coach Shantay Legans is excited about EWU’s home slate. “We are not going to play too many teams like the two teams we just played,” Legans said. “But Green Bay is a really good team, and Morehead State and UMKC are really good basketball clubs, too. We get to play them at home and get our own fans behind us. EWU was shorthanded in both of its losses, playing without four of its top eight players due to injury: All-Big Sky post Mason Peating, and guards Jacob Davidson, BYU transfer Stephen Beo and Ty Gibson. 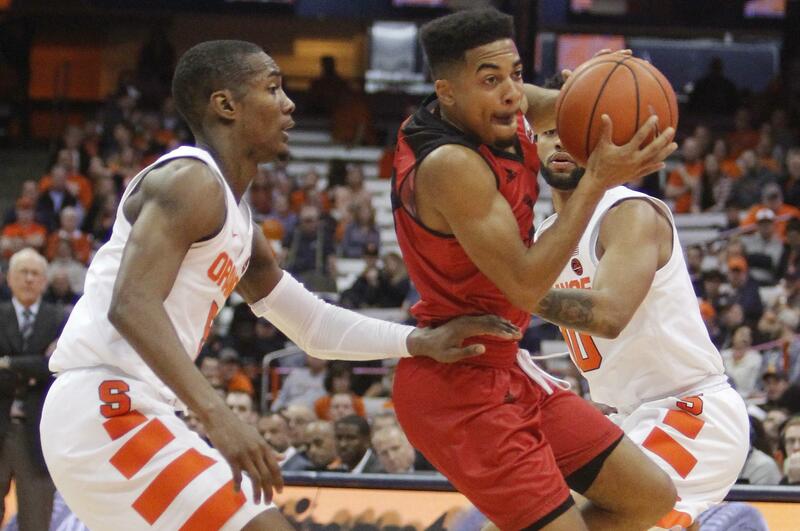 Gibson played briefly against Syracuse before going out with an injury. He returned to practice this week, but it’s unclear when Peatling, Davidson and Beo will return. Guard-heavy EWU, picked to finish fourth in the Big Sky Conference by coaches and media, shot 19 for 80 from 3-point range against the lengthy Orange and Ducks. Cody Benzel had 16 points in the loss at Oregon. Green Bay, picked fifth in the Horizon League preseason polls, dropped a 93-82 decision at Iowa on Sunday. Its lone win was against NCAA Division III Wisconsin Lutheran. The Phoenix are led by 6-foot-5 guard Kameron Hankerson, an All-Horizon League preseason selection. Inside, Green Bay looks to 6-foot-8 Manny Patterson, who has averaged 13.7 points and 6.7 rebounds through three games. UMKC (0-3) lost to 2018 Final Four qualifier Loyola-Chicago, Iowa and UConn to to start the season. Brandon McKissic, a 6-3 guard, has averaged 13.0 points for the Kangaroos, who were picked seventh in the WAC preseason poll. Morehead State (1-2), from Kentucky, also faced Syracuse last week, falling 84-70. The Eagles, picked 10th in the Ohio Valley Conference preseason poll, are led by guard Jordan Walker (16.7 ppg). Published: Nov. 15, 2018, 8:46 p.m. Updated: Nov. 15, 2018, 9 p.m.